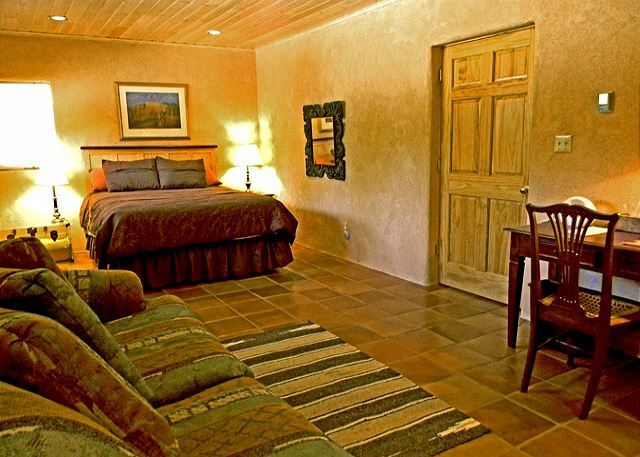 Arroyo Seco - Valdez Valley - Turley Mills - 14 Miles to Taos Ski Valley 14 Miles to Taos Village, 6 miles to Village of Arroyo Seco with 2 stop signs. 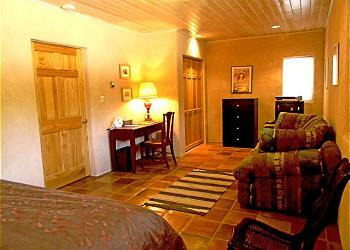 This "Guest House" consists of two stories with a first floor bedroom & adjoining bathroom, foyer and laundry room. The second floor hosts the fully-equipped kitchen / living area + bedroom & adjoining bathroom and was built by the owner / designer / architect / engineer as the family's home while he "hand built" their residence (now the secluded main house) which is well separated and offering total privacy on the 13 acre secluded retreat. 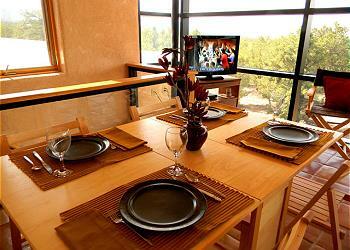 For guests who wish, owners are available to provide sightseeing tips and information on local activities. The retreat, surrounded by pinions and cactus at an altitude of 8000 ft. on a 13 acre property abutting Kit Carson National Forest, offers thousands of acres of hiking and exploring. 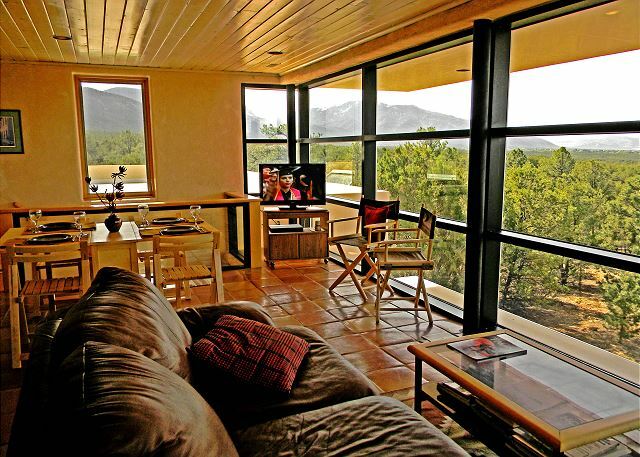 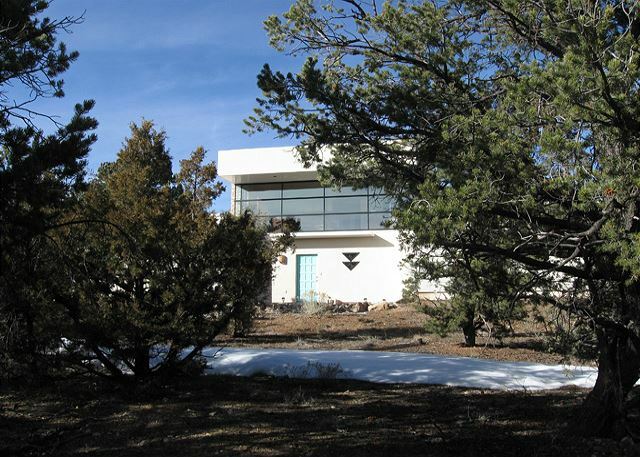 The floor to ceiling windows in the living room/kitchen of this unique and inviting guesthouse provide a spectacular view over a sea of trees to the town of Taos, the mesa and the mountains beyond. 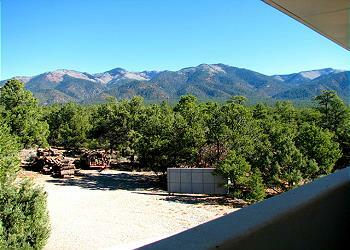 The view includes mountains over 85 miles away. 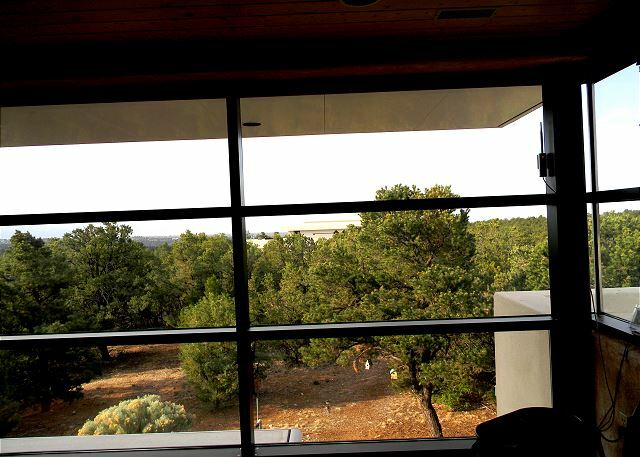 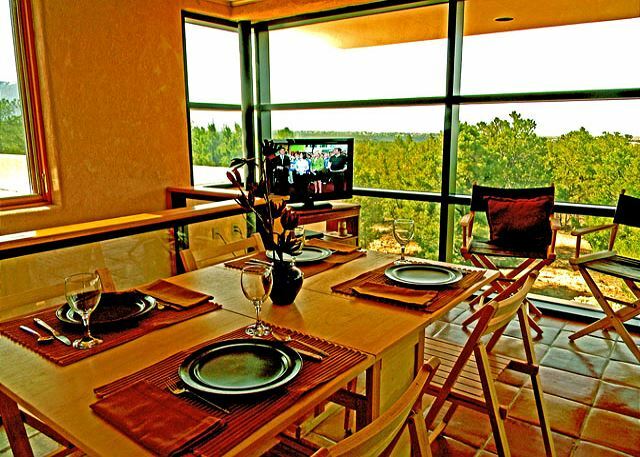 From the lving room, top floor bedroom and the balcony (accessed by two sliding glass doors) guests have two different breathtaking mountain view. 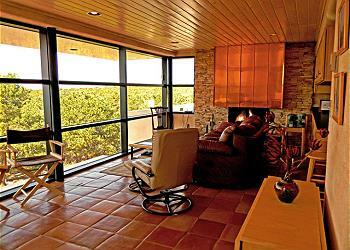 sunsets and sunrises. 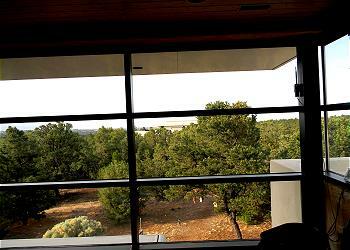 Both are glorious. In addition to window wall panoramic views, the grande stone "wood burning" fireplace competes for close second place. 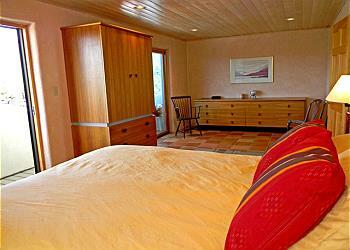 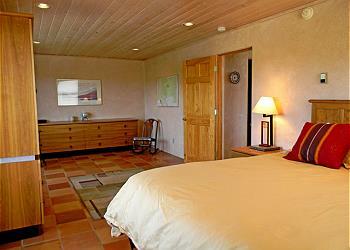 Each bedroom has one queen size bed. 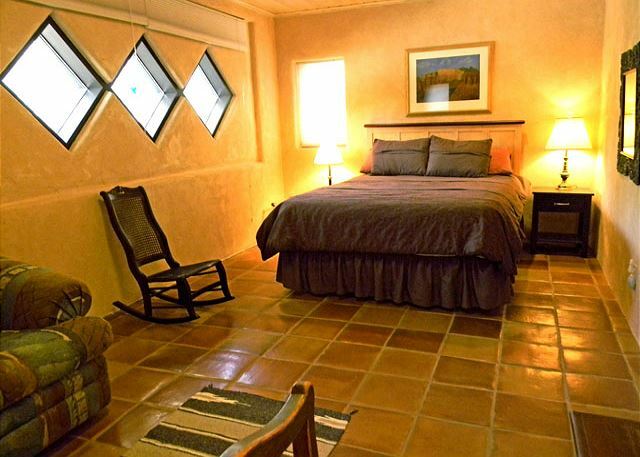 The first floor bedroom and the living room each have a sleeper sofa allowing 2 additional guests (most comfortably children) for a maximum total of 6 guests. As with the house itself, the furniture has been designed, hand crafted by the owner. 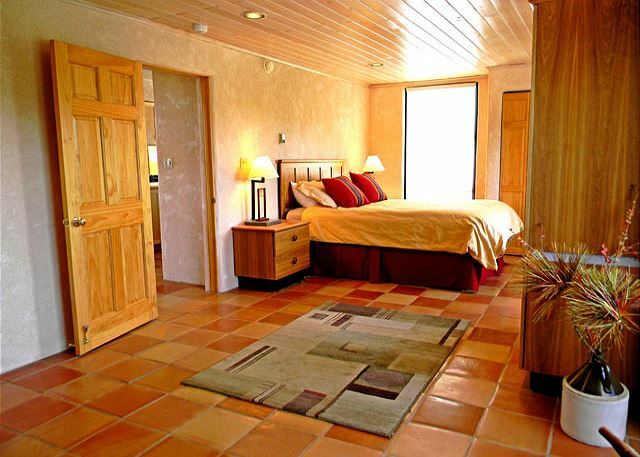 All of the floors are Saltillo tile and, when required, provide luscious radiant heat. 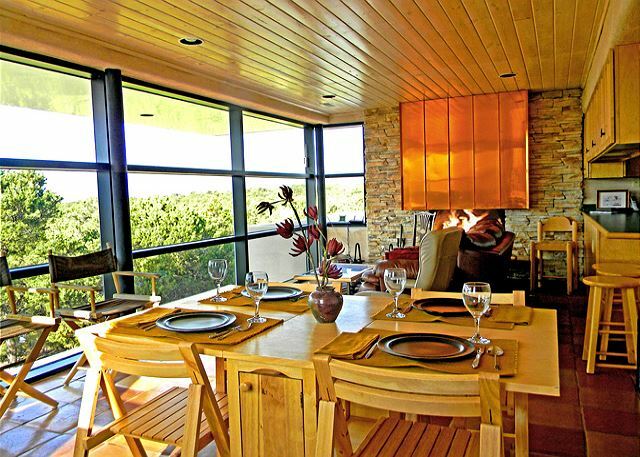 Passive solar provides most of the heat in the winter and window overhangs protect the house from excessive heat during summer months. 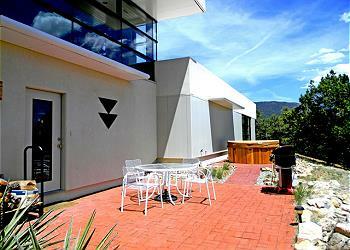 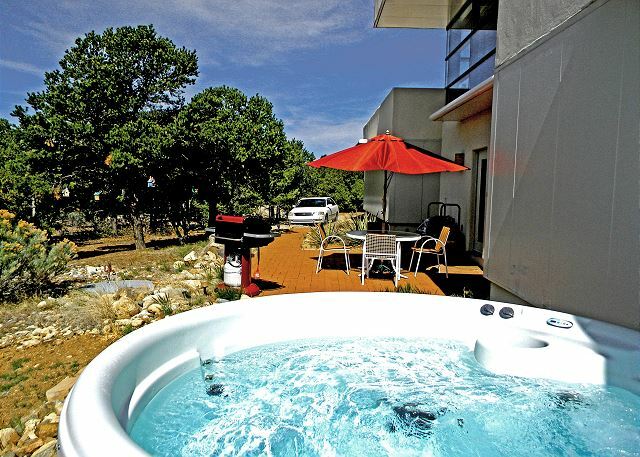 Water is solar heated on the roof adding to this eco friendly home. 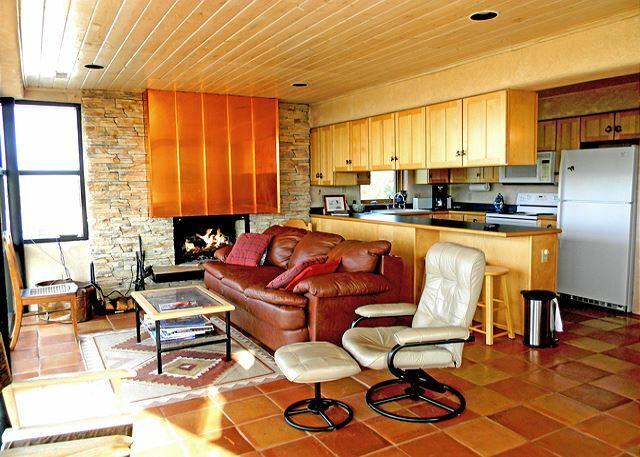 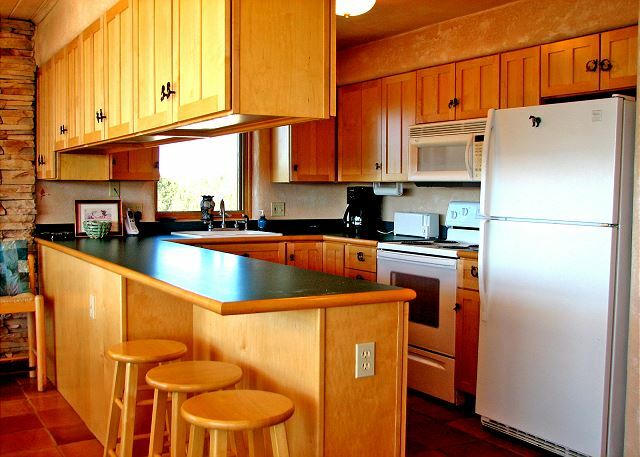 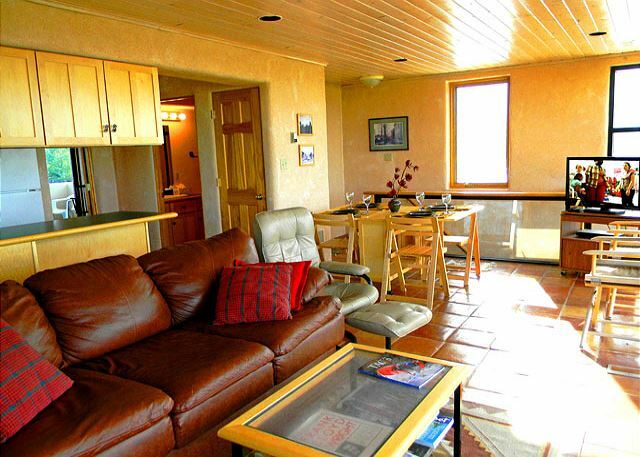 Guests find this home to be a welcoming, relaxing and comfortable retreat after a day of skiing, boarding, hiking, shopping, gallery hopping, sight seeing, or enjoying any other activity that this remarkable area has to offer. 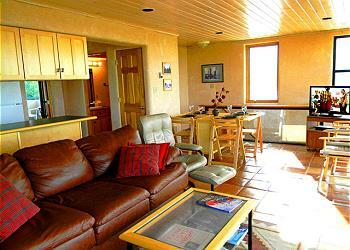 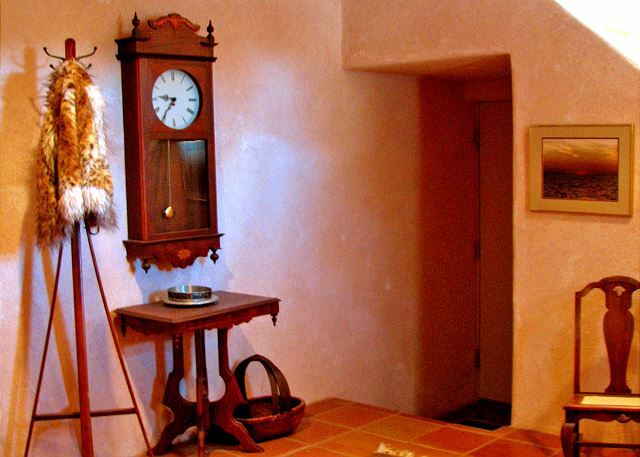 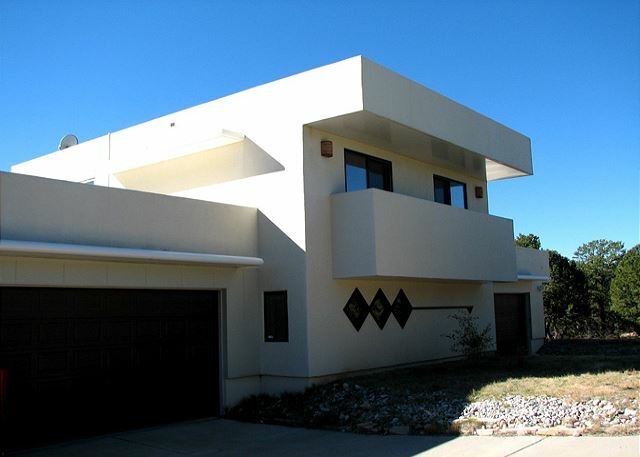 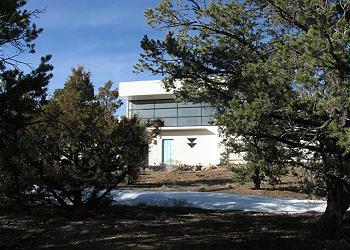 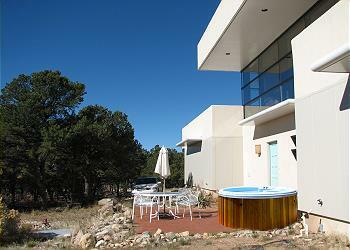 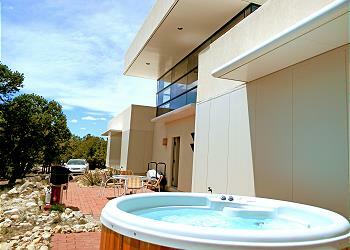 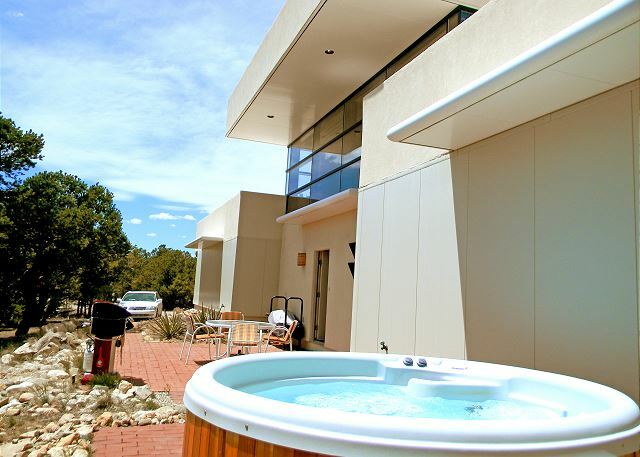 We invite you to come and enjoy the New Mexico sun in this rare and comfortable mountain retreat. 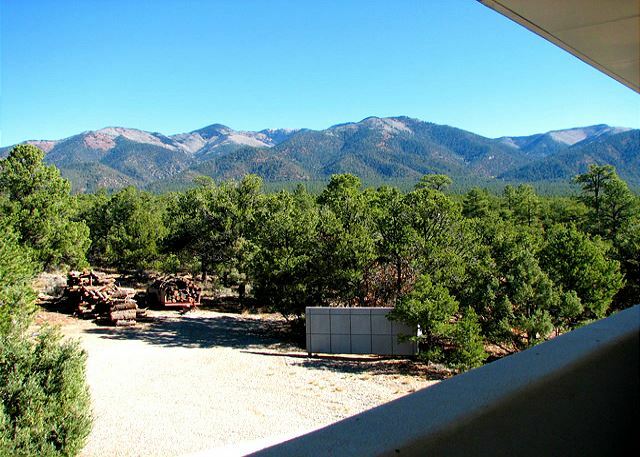 As this home is on a 3 mile well maintained hard packed gravel road and we are subject to a variety of weather conditions, we require that you have a four-wheel drive vehicle during winter months. Summer months require no special recommendations.